WSU’s Professional Science Master’s (PSM) in Electric Power Engineering combines advanced technical courses with professional management training to help students achieve high-paying employment. An innovative and relatively new type of degree program, a Professional Science Master’s, or PSM, trains students in an advanced scientific field while also teaching them the skills to be leaders and managers in a professional environment. Graduates will gain both an in-depth knowledge of electric power engineering and the managerial skills needed to advance in the industry. Required technical courses cover power systems analysis, power system economics and electricity markets as well as transmission and distribution. Electives are available in the performance of power systems, power electronics, power system protection and high-voltage engineering. Business courses range from law to finance to project management. The 30-credit program also includes an industry-based internship project, designed to provide you with real-world experience and valuable networking connections. This, plus the combination of core technical and business courses with flexible electives, means you will be uniquely qualified to meet the increasing demand for power engineering leaders with both technical skills and professional management training. 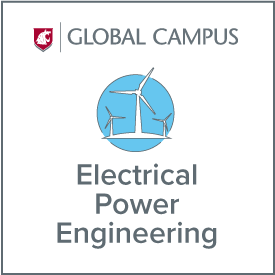 WSU’s power engineering faculty includes recognized experts in all areas of power engineering, including a member of the National Academy of Engineering, and four faculty members who are fellows of the Institute of Electronic and Electrical Engineers. To apply for the program, you’ll need a BS degree in electrical engineering or the equivalent. Visit Admission Requirements. More information is on the WSU Graduate School website. Please note that the priority deadlines listed there do not apply to this degree. If you have questions about the degree, please contact Patti Elshafei at pelshafei@wsu.edu or 509-335-0125. Up to two other relevant courses may be substituted upon departmental approval.